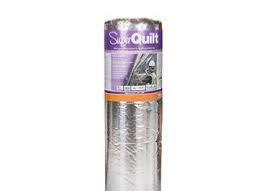 YBS SuperQuilt Insulation is the world's highest performance EN certified multi-foil insulation. A combination of 19 layers or TRUE aluminium foil, wadding and foil thermo membrane is what makes this insulation so special. Ideal for both DIY and Trade and designed to save space compared to fitting foam insulation products. The unique patented technology allows the material to expand where necesary, increasing overall thermal performance.